Russell THARP was born about 1870 in , , Tennessee. Russell married Nancy Olive SWINEA. Nancy Olive SWINEA [Parents] was born on 23 Jul 1874 in , Hardin, Tennessee. She died in 1880 in , Hardin, Tennessee. Nancy married Russell THARP. Francis LaVaughn THARP was born in 1925. He died in 1968. Jacob Horace "Jake" HOLLINGSWORTH [Parents] was born in Mar 1840 in , Clarke, Mississippi. He died on 8 Jul 1923 in Estesmill, New Hope, Leake, Mississippi. He was buried in Pleasant Hill Baptist Church Cemetery, Carthage, Leake, Mississippi. Jacob married Lurany BURT on 21 Jan 1869 in , Clarke, Mississippi. Lurany BURT [Parents]. Lurany married Jacob Horace "Jake" HOLLINGSWORTH on 21 Jan 1869 in , Clarke, Mississippi. F i Mary Roseanna "Anna" HOLLINGSWORTH was born on 14 Feb 1872. James QUERY "Jr" [Parents]. James married Lavica A. HOLLINGSWORTH about 1877. Lavica A. HOLLINGSWORTH [Parents] was born on 28 Dec 1859 in , Harrison, Ohio. She died on 10 Jul 1940 in Villisca, Montgomery, Iowa. Lavica married James QUERY "Jr" about 1877. SULLIVAN. SULLIVAN married Mary Ann HOLLINGSWORTH. Mary Ann HOLLINGSWORTH [Parents] was born in 1833 in , , Tennessee. Mary married SULLIVAN. William SULLIVAN was born about 1859. M i James RATLIFF was born in 1856. He died in 1921. Thomas MAY. Thomas married Martha. Martha. Martha married Thomas MAY. F i Sarah Amanda MAY was born on 4 Feb 1852. She died on 4 Jul 1935. John H. HOLLINGSWORTH [Parents] was born in 1840 in , Hardin, Tennessee. He died in 1885 in , Hardin, Tennessee. He was buried in 1885 in Sweeny Cemetery, , Hardin, Tennessee. John married Keziah Loutishi SWINEA about 1870 in , , Tennessee. 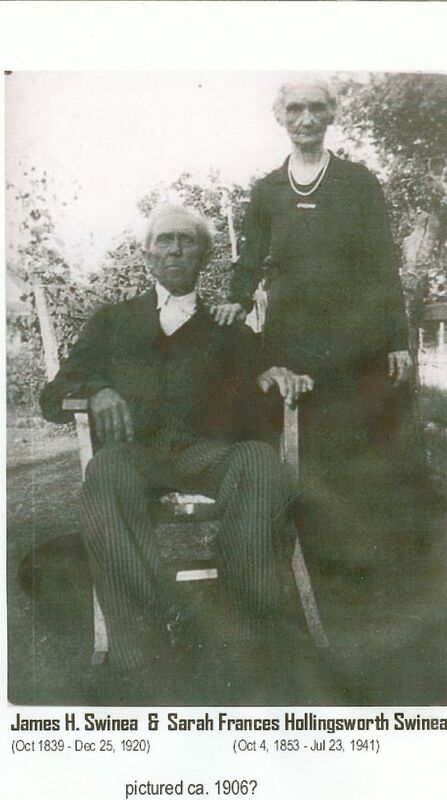 Keziah Loutishi SWINEA [Parents] was born in Apr 1848 in , Hardin, Tennessee. She died on 24 Jul 1919 in , Hardin, Tennessee. She was buried in Sweeny Cemetery, , Hardin, Tennessee. Keziah married John H. HOLLINGSWORTH about 1870 in , , Tennessee. Mollie F. HOLLINGSWORTH was born in 1871 in , , Tennessee. M ii William Levi HOLLINGSWORTH was born on 17 Mar 1873. He died on 14 Mar 1967. Julia A. HOLLINGSWORTH was born in 1875 in , , Tennessee. M iv John Henry HOLLINGSWORTH was born in 1877. He died on 29 Jul 1947. J. R. HOLLINGSWORTH was born in 1878 in , , Tennessee. M vi Jason Walstine HOLLINGSWORTH was born on 24 Feb 1884. He died on 6 Nov 1955. William SWINEA was born on 23 Aug 1807. He died on 21 Jan 1885 in , , Tennessee. William married Nancy P. NORWOOD. Nancy P. NORWOOD was born on 14 Mar 1825. She died on 15 Jan 1892 in , , Tennessee. Nancy married William SWINEA. M i James H. SWINEA was born in 1840. He died on 25 Dec 1920. F ii Keziah Loutishi SWINEA was born in Apr 1848. She died on 24 Jul 1919. Nathan C. PRIOR was born in 1814 in , , Tennessee. He died before Sep 1864 in , , Tennessee. Nathan married Lucinda S. BOSHERS on 23 Aug 1842 in , Lawrence, Tennessee. Lucinda S. BOSHERS was born in 1827 in Leoma, Lawrence, Tennessee. She died on 7 Sep 1899. Lucinda married Nathan C. PRIOR on 23 Aug 1842 in , Lawrence, Tennessee. M i Andrew P. "Andy" PRIOR was born in Jan 1845. He died on 5 May 1909. James H. SWINEA [Parents] was born in 1840 in , Hardin, Tennessee. He died on 25 Dec 1920 in , , Tennessee. He was buried in Shilo National Cemetery. James married Sarah Frances HOLLINGSWORTH. Sarah Frances HOLLINGSWORTH [Parents] was born on 4 Oct 1853 in , Hardin, Tennessee. She died on 23 Jul 1941 in , Hardin, Tennessee. She was buried in Shilo National Cemetery. Sarah married James H. SWINEA. F i Nancy Olive SWINEA was born on 23 Jul 1874. She died in 1880. F ii Jo Hannah SWINEA was born in 1881. She died in 1949.